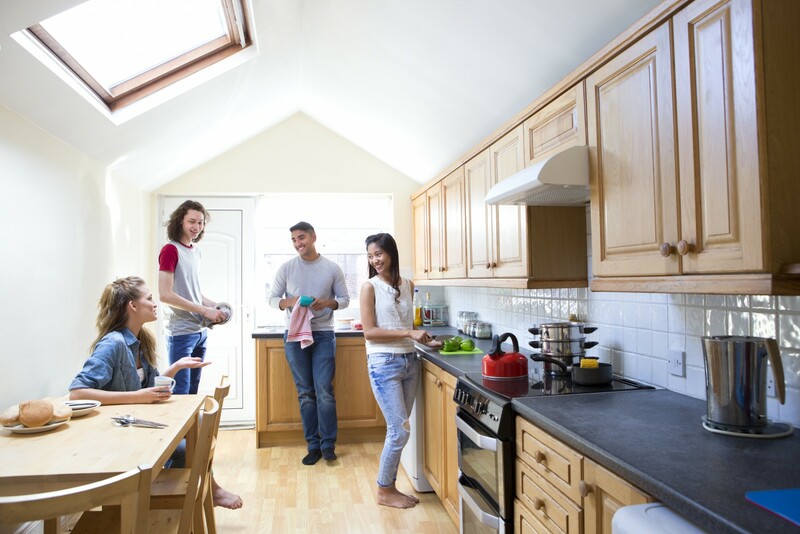 Keeping the peace with your roomies can be as easy as setting expectations and giving everyone their own space. Storage bins and plastic stackable boxes can also save the day — especially when it comes to bathroom storage. Put your skincare items in one and your dental products in another. These stackable boxes come in all sizes — the ones with more depth can fit your bulkier products, and the shorter boxes are better for smaller items, like your travel-size products. Air out your countertop pet peeves — you can always find ways to avoid potential disagreements. The key is deciding as a team in advance what’s fair — and sticking to it. If one of you has a pet, how do you decide where the crate, toy basket, and food and water bowls go? It may make sense to put pet items in common areas, but the pet owner shouldn’t assume all roommates are cool with squeaky toys all over the living room floor — no matter how cute that pup is. You can even turn it into a chance to get to know your roommates better. Have a cool story about where you got that tapestry? Got your favorite mural while studying abroad? Tell your roomies all about it — and listen to their stories too. They may be cool with your wall decor once they know the meaning it holds. Adhesive hooks are great for hanging towels when you need extra bathroom space — or for hanging keys in the entryway.